Rhinoplasty surgery must be tailored to the individual to appear natural and in harmony with the patient’s face and ethnicity. African-American rhinoplasty surgery is one type of ethnic nose reshaping, which is used to refer to any nose surgery performed on non-Caucasian patients. 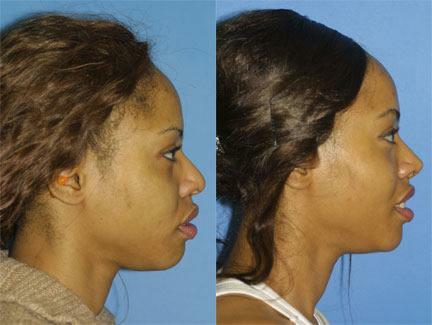 As with other sub-sets of nose reshaping, this procedure is designed to consider the specific and unique characteristics and concerns of African-American patients. Dr. Miller understands that many patients are concerned about losing their ethnic identity through surgery, or getting a nose that looks “too Caucasian.” Dr. Miller performs each nasal surgery with a specialized approach that addresses the concerns of patients without sacrificing the ethnic characteristics or harmony of the face. Wide nostrils are a common concern among African-American patients, as well as a wide nasal tip and a wide nasal dorsum, or wide low hump. Each of this issues requires a unique approach. Dr. Miller employs specialized techniques to perform African-American nose job surgery to achieve the desired results for patients without taking away from their ethnic identity. Dr. Miller has more than two decades of experience as a facial plastic surgery and begins each procedure by first creating a customized treatment plan for the best possible results. To find a qualified African-American “nose job” surgeon in NYC, begin by looking at each surgeon’s experience with this specific procedure. You want a facial plastic surgeon who is credentialed and very experienced with this procedure, specifically on African-American patients, with a knowledge of the unique characteristics of the African-American nose. It is very important to make sure you understand the abilities of your surgeon by reviewing before and after photos, particularly pictures of this procedure. The ideal candidate for African-American nose surgery is at least 16, a non-smoker and in good physical health. The best way to find out if you are a good candidate for this surgery is to have a consultation with an experienced facial plastic surgeon who specializes in the procedure. After examining your nose, the surgeon will be able to give you a surgical plan to resolve your concerns while preserving the ethnic features of your nose. If you want to learn more about this procedure in New York City, contact our office today to schedule a consultation with Dr. Miller. Fill out the contact form or call our office at (646) 791-3025 and a patient advisor will help you. Next, learn about Asian rhinoplasty.